Above: Background—Robert McGinnis’s cover for Ellery Queen’s Best Mysteries of 1964; Left to Right: Saturday Evening Post illustration by Edwin Georgi from the ’40s; iconic image of Sean Connery from the poster for From Russia With Love by Renato Fratini, 1963; Alex Raymond’s comic strip detective, Rip Kirby, circa 1950; Peter O’Donnell’s exotic comic strip and book heroine Modesty Blaise by Jim Holloway. It’s always exciting to get a new assignment. I never know what will be thrown my way. As an old London hand and one-time student at Cambridge, I often get stories set in the UK, so they’re a natural fit. Sometimes however, the stories can be pretty tough to crack and I’ve wondered if that’s not on purpose—in a good way. Although not specified, there’s one major caveat: Don’t give away the plot! My goal as an artist is to come up with a compelling composition that tells enough or part of the story to get the reader interested and involved so they’ll want to dive right in. I always hope that by the end of the story the reader goes back to look at the art and has an “Aha!” moment. Here’s the process: Unlike the old days of getting the MS by snail mail (not a bottle) it has come by email for many moons. I’ll read the script and usually certain passages, characters, or ideas will jump out at me. Generally I start doing thumbnail sketches whilst the ideas are fresh. Sometimes if the story is complex or I’m stuck, I’ll rest on it a day or two; but the best way is to start right in as one idea leads to the next. I used to scribble these on the printed-out MS itself, but these days I read off the screen and the thumbs go right into my sketchbook. At this stage I usually step back for a few days to choose my three strongest concepts. I always revisit the story to check details. Then I draw three fairly tight sketches at the size at which they’ll be printed. These I present to the art director and editor for approval. I try to think through each sketch carefully so no matter which one is selected, I’ll feel confident going into the final. Many times, research is required about certain aspects of a story. This is something I have enjoyed immensely my entire artistic life, whether as a scenic designer in the theatre, an illustrator, or an author: To continually learn and explore, satisfying basic human curiosity, that’s the very basis of detection—the need to know, to discover. Part of detection is making connections. At times I’ll use photography, often casting family, friends, actors, wait staff, and even Yrs. Trly as characters. Others come straight out of my head based on the story, and others from my travel sketchbooks or file photos. The fun part is you just never know. Most recently, I used my oldest friend and his younger brother as models in the same illustration. I’ve used their mom as well. The style has evolved some over the years, and it’s funny to think back to the original samples I sent in, which were in a woodcut style I’d developed doing packaging illustration for Pier 1 Imports. 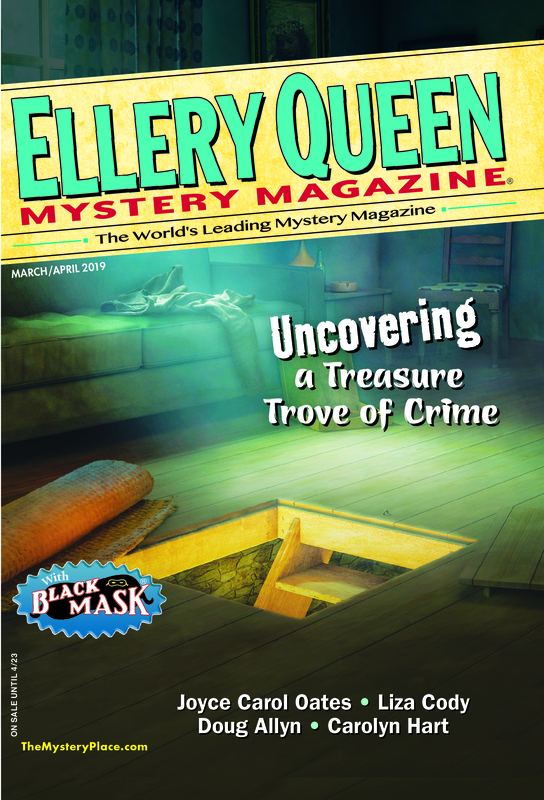 Originally, they were sent to Alfred Hitchcock’s Mystery Magazine, and not to Ellery Queen! Regular readers will note the cinematic and film noir influence in the angles and compositions. As I mentioned, I’m also an author of mystery. The compulsion to write took hold at an early age, formulated by many factors. Popeye, Roy Rogers, and Lassie had been vanquished in the span of a couple of years by the explorations of John Glenn in outer space and Jacques Cousteau under the sea; seeing Lawrence of Arabia, 20,000 Leagues Under the Sea, and Fantasia; but then I was caught up in a real-life mystery, very close to home. By circumstances I may relate at another time I ended up in Dealey Plaza (a very familiar place, where the “Hertz Building” was) about three hours after President Kennedy’s assassination. After this, despite the Beatles, I became fascinated with mystery and crime. Then the game-changer, seeing Goldfinger, and being totally caught up in the phenomenon that took the world by storm—James Bond, 007—the super-secret agent who traveled to exotic locations around the world and had incredible adventures and met beautiful women and fought the nastiest of villains. It was undoubtedly Ian Fleming who inspired me to write fiction. It was a hot summer day in New York City, 1966, when I spied with my little eye copies of From Russia With Love and Doctor No at a used bookstall. The stylish cover art by Barye Phillips was especially tantalizing. Some pleading and allowance money soon found them clutched in my hot sweaty little nine-year-old hands. I was hooked. Doctor No remains an accessible read. As a child I noted all the differences between book and film, one of the main ones being the spider /centipede passage. In the film, Professor Dent (not in the book) picks up a deadly spider in a scene memorable for both Ken Adam’s futuristic sets and the sonorous voice of the all-powerful, all-seeing unseen Doctor No. The scene that follows in the film is harrowing, yet in the novel, as written by Fleming, a deadly centipede is used to even greater effect. Other horrors await 007, but this particular sequence stands out. It is one of the most suspenseful passages anywhere, easily on a par with The Tell-Tale Heart. In the space of but three pages Fleming’s words transfixed and terrorized the nine year old that was me, and still do to this day. They were what first inspired me to write fiction. I began to devour any and all mystery fiction and cinema, all the while still enjoying Sherlock Holmes, Stevenson, Poe, Lovecraft, Man From Uncle comics, and even the Hardy Boys. But I had a problem. I simply could not understand plotting, or how to create a scenario and storyline. I also felt I simply didn’t know enough about life yet to write, so I set myself a goal—that I would start writing after I turned forty. I set about reading and learning—and living. Then, and to this day, I read everything I could of mysteries, thrillers, crime, and noir. Fast forward to the late eighties: I was in Puerto Vallarta, soaking up the sun, reading John D. MacDonald’s Darker Than Amber, the strains of the Fine Young Cannibals thudding in the background, and suddenly I was inspired. I started writing down all sorts of story ideas. Within a year I made my first notes about a Scotland Yard Detective and three kids who always get mixed up in his cases. Concurrently, working a roadshow production of Les Miserables, I met an actor named Kelly Briggs, who was a relative of—and named for—the Late Grace Kelly, Her Royal Highness Princess Grace of Monaco. This sparked my imagination, but I made a small adjustment with the family name. About six years later I turned forty, and started writing the first incarnation of Kelly Riggs, which, fourteen years later, turned into my 2011 opus, The Case of the Blood Red Stars, A Kelly Riggs Mystery, illustrations c’est moi. In the meantime, I began writing short stories with Forgotten Horrors author, cinematic and musical expert, journalist, and comic artist Michael H. Price, published by Midnight Marquee Press: What You See May Shock You! (2009). A collection of postmodern pulp fiction, the stories range from supernatural to horrific; ironical to whimsical. We are putting the final touches on new stories (and “illos”) for an expanded edition to be released Christmas 2013, entitled Dark Borderlands. As a writer, I owe a huge debt of gratitude to Ian Fleming and the passage of a centipede, not to mention all those before me; and as an illustrator and lover of mystery, suspense, noir, the horrific and fantastical, I’m grateful and fortunate to be part of this rich, mysterious world. This entry was posted in Books, Characters, Genre, Guest, History, Illustration, Magazine, Noir, Setting and tagged art, artists, design, eqmm, illustration, illustrator, mystery, noir, thriller. Bookmark the permalink. As the writer of one of the stories you used as an example–and the mother of two artists–I loved seeing your process. Best of luck with DARK BORDERLANDS, and I look forward to seeing you work in EQMM for years to come. Best explanation of the creative process I’ve found in a long time, Mark. Reflects many of our conversations, with a wealth of additional insights. Delighted to have the DARK BORDERLANDS project simmering along. About time for a rolling boil. A lot of fun, and informative, too. When my first story was published (in Mike Shayne MM) my biggest thrill was seeing the illustration. The editor could have bought it without reading it, but the illustrator, ah, he had paid attention! Thanks for this, Mark! I’ve always wondered about the people behind the illustrations. A remarkable talent, and an honor to know you MEW. Lovely explanation of process and great work!